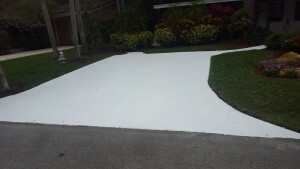 Mr G hired us to make his old concrete driveway look like new. Portions of the concrete slab where beyond repair. Step number one was to jackhammer, saw cut and remove the old concrete. We saved as much of the driveway as we could. To help keep the cost down. Reinforcing steel is epoxy doweled in to adjacent concrete. 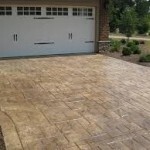 Preventing cracks from developing where new and old concrete meet. Mr. G wanted white concrete for a replacement sidewalks and we mixed white Portland cement sand a aggregate using the 1-2-3 recipe. That concrete recipe is That is 1 part cement, 2 parts sand, 3 parts gravel, and 0.5 part water. The is formed, mixed, pour and finished. 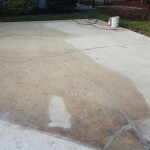 Next, we epoxy injected cracks in the old concrete driveway. Some cracks where saw cut and cleaned prior to the epoxy injection. 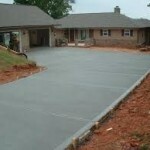 The new concrete cured and all of the repairs completed. 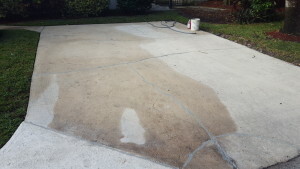 The entire driveway receives a skim coated with concrete slurry. Creating a uniform appearance. 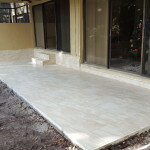 We applied concrete slurry using a hopper gun and knocked it down for the desired texture. our crew wears spiked shoes so they don't leave footprints in the newly applied concrete slurry texture.